What makes Xamarin Forms such a great development tool is being able to develop apps cross platform, thus cutting your development time way down. In developing several mobile apps, we’ve created some components to make that cross platform development even easier. The TrakPopup allows you to popup a new window on top of existing windows with your own design in the new window. The TrakPopup control when invoked will insert itself into the Xamarin Forms Visual Tree with the parent being the page. 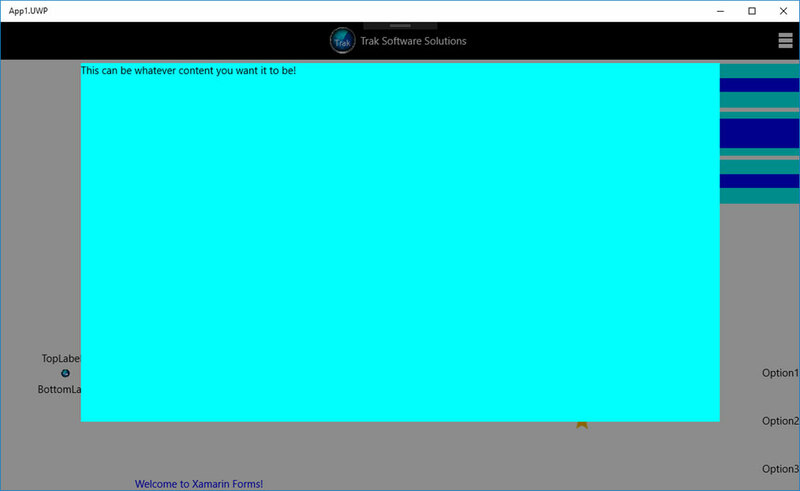 It will overlay the current page content with a black film to show the current page is disabled. The popup window can be placed anywhere on the screen using Constraints. The Constraints for Left, Top, Width and Height work the same as they do for the RelativeLayout. The parent for the Constraint will be the RelativeLayout container in the TrakPopup control that will be the size of the entire page. To automatically close the Popup window, you can touch or click anywhere outside of the Popup window. Defaults to a blank view. You can use XAML to define a custom layout using standard Xamarin Forms controls. Defaults to the left side of the page. Defaults to the top of the page. Defaults to the width of the page. Defaults to the height of the page. Defaults to True. If this is set to false, the user will not be able to touch and/or click outside the Popup Window to close the Popup Window.